A VISA® Credit Card from Bethlehem 1st FCU is your passport to the finer things in life. It’s accepted around the corner or around the world at the finest shops, restaurants and hotels. You will find the familiar VISA® sign displayed almost everywhere you go. Bethlehem 1st FCU also offers a VISA® Preferred Card with a lower rate for members who qualify. 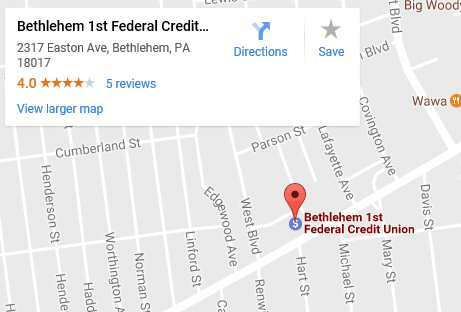 How do I apply for a Bethlehem 1st FCU Visa Card? Verified By Visa: How Do I to Protect Myself When Buying Online? Account Summary–Get a snapshot of your account balance, available credit, payment information, credit limit, and all recent transactions that have not yet been billed. Full Statement–You can view 6-18 months of your credit card account history. Bill Payment–Make credit card payments directly from your share draft (checking) or share (savings) account. Transaction Tracking–View transaction information, assign expense categories and add memos, which can be searched at a later time. Alerts–You’ll be notified when a transaction seems suspicious. You will then be asked to confirm the transaction is legitimate. This service will first attempt to text you, then will voice call, then email you. There is no need to enroll, but you can opt out. Alerts are also available through Visa Purchase Alert. Find Transactions–Search statement information for specific transactions. Download–Download information to use with your own money management software (e.g. Quicken). Customer Service–Answers to many of your VISA questions; Research and dispute transactions, if necessary. Using your Internet browser (Internet Explorer, Chrome, Firefox, etc. ), go to eZCardInfo.com. If this is the first time you are using the new VISA site, click on the “Enroll for Online Services”. You will be asked to choose a user name and password, and register your e-mail information. Once logged in, in addition to gaining access to your VISA account information, you may opt to disable online access. Some institutions offer what are often referred to as ‘teaser’ rates. They look inexpensive at first, but watch how high the interest rate goes after that introductory period is over. Like all of Bethlehem 1st FCU’s offerings, our VISA card has maximum convenience with minimum ‘gotcha’. In addition to the “standard” VISA Credit Card, Bethlehem 1st FCU now also offers a “preferred” VISA Credit Card. This new card provides a low rate of 9.90% APR to those who qualify. Qualifications are based on your FICO/Emperica credit score. Other restrictions may apply. Should a cardholder who has been converted from “standard” to “preferred” be late in their payment for two consecutive months, their card will automatically revert to a “standard” card and carry the higher interest rate. Any purchases made prior to the conversion will continue to be charged at the “standard” rate. Only new purchase will receive the new “preferred” rate. Stop by or call our office at 610-691-0041 for details. You may elect to have your monthly payment, full payment, or an assigned amount made by an automatic withdrawal from your Bethlehem 1st FCU Share or Share Draft Checking Account. Call member services at 610-691-0041 for information. You can report a lost or stolen card 24 hours a day, 7 days a week by telephone. HINT: To protect yourself in the event of losing important cards you carry in your purse or wallet, it is a good idea to photocopy all of the cards (front and back). Store the photocopy in a safe place for reference in case any or those items are lost or stolen. How do I protect myself when buying online? If you purchase goods on-line using your Bethlehem 1st FCU Visa Card, you may be required to enroll in the Verified by Visa program before you can complete your purchase. The enrollment process, which is done on a secure Visa site, verifies your identity based on information you have provided to the Credit Union. It then requires you to create a password. The password is stored securely on Visa’s computer systems (not the merchants’). Each time you make a purchase at a participating merchant’s website, you will be asked for the password. No charges can be made without the correct password. Bethlehem 1st FCU encourages you to sign up for Verified by Visa as soon as possible to help avoid on-line credit card fraud and to make your on-line purchasing experience easier. Verified by Visa helps prevent unauthorized purchases before they even happen. Protect your existing Bethlehem 1st FCU Visa card by creating a personal password as unique as you are.Verified By Visa helps ensure that only you can use your Visa card to buy online at participating online stores. Register today! It takes just a few minutes to activate. Click here to register or for more information.